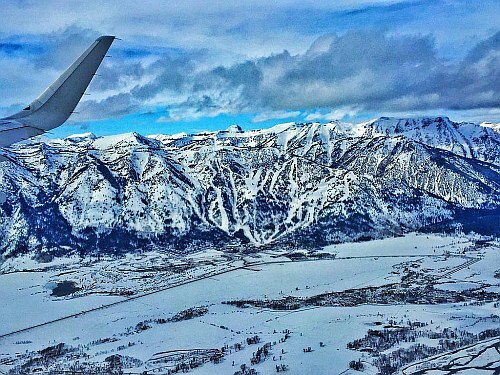 United Airlines and Delta are showing some unusually low prices from Calgary to Jackson Hole, Wyoming for $332 CAD roundtrip including taxes during ski season. Flights from Calgary to Jackson Hole (JAC) usually bottom out closer to $550 to $600 CAD roundtrip. Smaller airports tend to be pretty expensive to fly to. The flights have 1 stop each way, in Seattle, Denver, or Salt Lake City. There are also flights from Calgary to Bozeman, Montana (BZN) for $281 CAD roundtrip (Bridger Bowl and Big Sky). Although they route through Denver, so it may not be any faster than driving. There's also one flight from Calgary to Aspen, Colorado (ASE) for $380 CAD roundtrip. It departs on New Year's Day. March flights are available for $425. 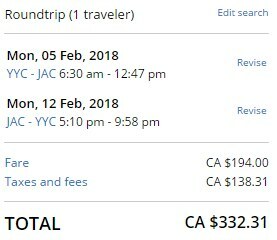 ^^ You can also find flights in March for $368 CAD roundtrip. 2. Select your flights in Google Flights and click through to the Delta or United Airlines website for booking. calgary, yyc, united states, flight deals, delta, colorado, united airlines, north america, jackson hole, wyoming, jac, aspen and ase. One Response to "For the skiers & boarders: Calgary to Jackson Hole, Wyoming or Aspen, Colorado - $332 to $381 CAD roundtrip "